The littlest of law books for artists, students, teachers and anyone looking for a creative approach to the law, a single-cup-of-coffee read. A simple voice for complex times from Wild Palms Press. On the scales of justice, an ounce of words weighs no more than an ounce of feathers. The littlest of law books, a single-cup-of-coffee read, Civil Law in America: A Minimalist Law Book is a creative, simple, and uniquely concise expression of the law. Only sixty brief pages in length, the book is not a law treatise, casebook, "how to," substantive reference, or primary or secondary law source. 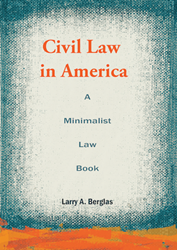 Like artwork painted from memory that conveys its subject with only essential lines and gestures, Civil Law in America: A Minimalist Law Book thoughtfully provokes on the issues of the law. Inspired by art and music, the book was written for artists, students, teachers, and anyone interested in legal issues. More like songwriting than legal writing, this easygoing book provides a spare, lyrical foundation for understanding the law. Larry A. Berglas is a writer, teacher, musician and practicing attorney with more than twenty years of multidisciplinary experience in the law. Larry teaches Arts & Entertainment Law and Law and the Arts at Purchase College in Purchase, New York.